The department of general surgery has now become a Tertiary referral center. An increasing number of patients with complex ailments/conditions are referred to Revathi Medical Center for surgery. 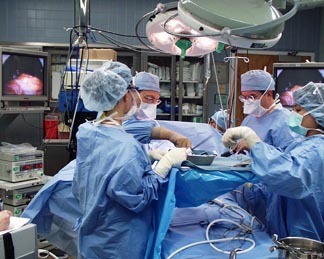 General surgery procedures on Endocrine glands, salivary glands and oral cavity, breasts, neck, hernia, male genital abnormalities, rectal procedures for piles, fistula, cancer, spleen and blood disorders like sphercytosis, ITP are regularly carried out in its 4 modular Operating theaters. A major advancement in this department was the introduction of high definition stryker laparoscopy, aiding advanced and better patient health care delivery system. Today, with laparoscopy many procedures including hernia repair,appendectomies, cholecystectomies, hysterectomies ,ovariancystectomies, Oophorectomies, sterilisation, surgery for ectopic pregnancy,adhesiolysis and diagnostic laparoscopy are performed with unmatched success rates. Ligasure- vessel sealing instrument has also been procured to facilitate better quality surgeries. Gastrointestinal endoscopic work is also undertaken. The surgical intensive care ward is a sophisticated unit with facilities to provide the best possible care. All equipments for life support and monitoring are there. There are facilities for artificial ventilation.